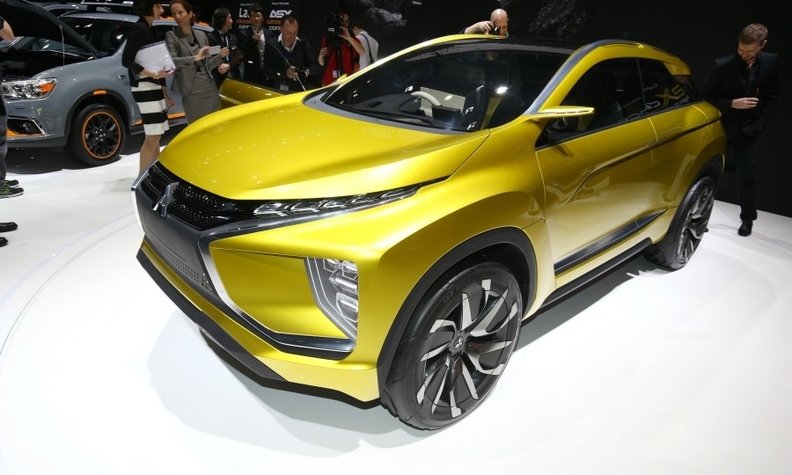 Mitsubishi's auto unit unveiled the EX autonomous-driving concept at the Tokyo auto show last year. TOKYO (Bloomberg) -- Mitsubishi Electric Corp., a supplier of air-to-air missiles to Japan's armed forces, is adapting technologies it originally developed for military use to help self-driving cars detect obstacles and avoid collisions. Components such as millimeter-wave radars, sonars, sensors and cameras -- some of which were developed to guide missiles -- are being adapted for use in self-driving vehicles that will hit the roads by 2020, Katsumi Adachi, senior chief engineer at Mitsubishi's automotive equipment division, said in an interview. It has received orders for automatic braking systems and instruments that help a vehicle keep to its lane, he said. The Japanese supplier is seeking to catch up with Continental, Denso Corp. and Hitachi Automotive Systems Ltd. in providing assistance technologies that are becoming increasingly standard offerings in new vehicle models. While its competitors have a head start, Adachi says Mitsubishi will be able to offer superior systems next year that will benefit from its expertise in high-precision sensors and electric-power steering systems. "All we have to do is to put together the components that we already have," Adachi said in Ako city, about 600km (375 miles) west of Tokyo, where Mitsubishi has a course to test cars installed with its systems. "None of our competitors have such a wide array of capabilities." The global market for driver-assistance features such as collision warning and emergency auto braking is projected by IHS Automotive to double to about $17 billion in annual revenue by 2021. Mitsubishi's push into this segment follows slowing growth in some of its businesses such as home appliances. The challenge for Mitsubishi would be to bring down costs for using technologies developed for industries such as aerospace, according to Goro Tanamachi, a Tokyo-based analyst at IHS. "Cost-cutting requests are much more severe in autos than aerospace," he said. "I wonder if it's possible for them to bring down the cost of the systems to the levels manufacturers can use for cheap, low-end cars." Mitsubishi will begin production of the components for lane-keeping and automatic braking systems in the year starting April 2017. And in the following fiscal year it may also start manufacturing automatic parking systems, according to Adachi. The Japanese company will combine the sensing technologies with its quasi-zenith satellite system that would send up-to-date location data to vehicles, Adachi said. Mitsubishi will have three more such satellites in geosynchronous orbit over Japan by around 2018 to gather data round the clock, he said. Mitsubishi, which demonstrated an autonomous driving prototype at the Tokyo auto show last year after starting development of driver-assistance technologies two years back, was encouraged by the demand for the EyeSight system in Fuji Heavy Industries Ltd.'s Subaru brand, according to Adachi. Subaru's system combines lane-keeping steering assistance, pre-collision braking control and adaptive cruise control to enhance safety. Sales from advanced driver assistance systems are expected to match its power steering or alternator business, Adachi said without providing a timeframe. The two businesses are the biggest contributors to the revenue from its automotive components division, which accounts for about half the company's annual sales of 1.3 trillion yen ($11.4 billion) from the industrial automation segment, he said. "At this point we still have a lot of challenges," said Adachi. "There's a long way to go."